Originally found in the hills above Rio de Janeiro Does well in pots and hanging baskets Blooms all spring, summer, and fall Hardy in zones 8-10, elsewhere patio or houseplant Immediate shipping in 4" pot. JASMINE: A jasmine plant is a great addition to a garden or a home. Jasmine, known for its beautiful flowers and shining leaves. There are 200 species, mostly from Asia, Europe and Africa. Jasmine is native to tropical and warm temperate regions. 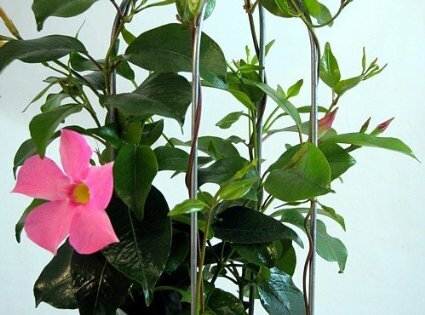 Pink Brazilian Jasmine (Mandevilla) Originally found in the hills above Rio de Janeiro Conditions: Does well in pots and hanging baskets. Requires sunny position, tolerates partial shade. Not frost tolerant. Needs well drained potting mix, with slow release fertiliser application in Spring and late Summer. Keep moist but do not allow to stand in water. Blooms all spring, summer, and fall! Indoors grow in a sunny window. Trim as needed!